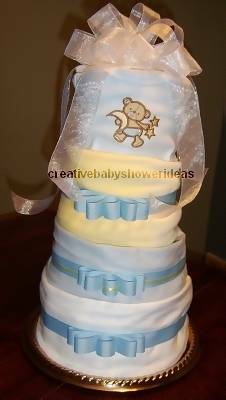 A diaper cake decoration is both useful and beautiful to display at a baby shower or a hospital. 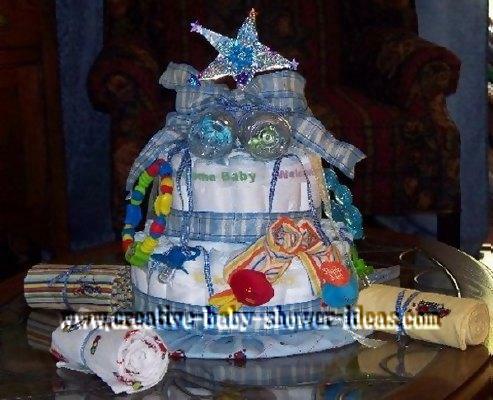 It is simple to make a diaper cake and easy to customize it to match your budget. 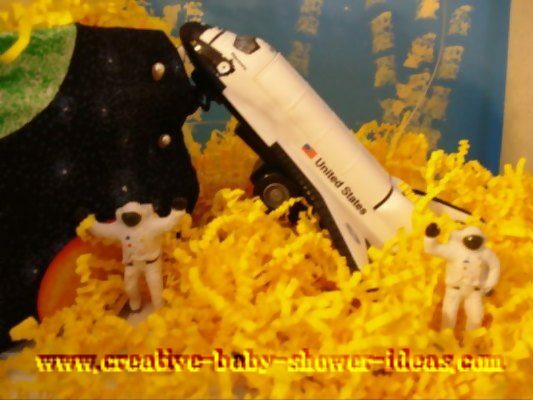 You've reached the moon and stars category of our diaper cake gallery. To see other pictures, click on the main index link below. 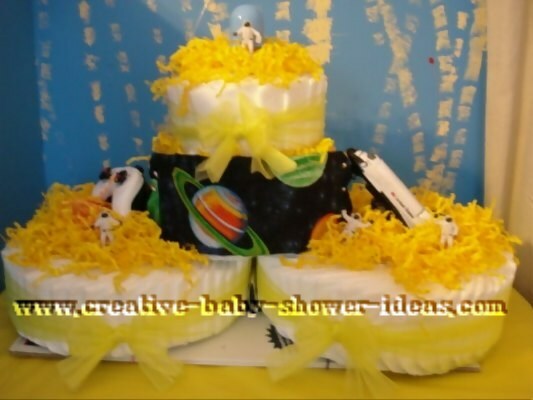 And if you do end up making a diaper cake, be sure to to take pictures and share your project with us! Yellow Fleece Blanket ~ 26"x26"
Infant Onesie Bodysuit says "Out Of This World"
Infant Bib Says: " Let my Little Light Shine"
Infant Onsie - Says: "Out Of This World"
I started by covering a cake board with a receiving blanket. Then rolled the diapers and created each layer. Added ribbon to accent the layers and attached various baby toys, bottles, and binkys to the cake. Finished it off by making a bow and a glittered star for the top and rolled the extra receiving blankets and tied them with ribbon. This is my very first cake and I used all the ideas on your site, thank you so much! I didn't have receiving blankets so the diapers are layers are covered with sleep sacks folded lengthwise. The top layer is 5 or 6 onesies rolled like the diapers. The 2 bottom layers have a bottle of shampoo in the center with 40 newborn swaddler diapers rolled around them. Thanks again for the ideas! I'll be a first time grand-mom with my son late July 09 and I'm co-hosting the baby shower. Instead of buying a centerpiece, I decided to try my creative hand. I had so much fun making this diaper cake and it took less than 2 hours! 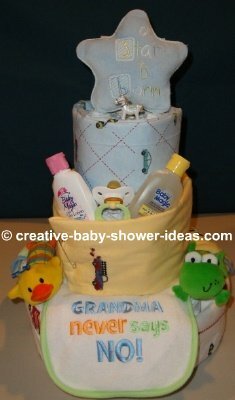 Share Your How To Make A Diaper Cake Pictures!